A bhikkhu (Pali; Sanskrit: bhikṣu) is an ordained male monastic ("monk") in Buddhism. 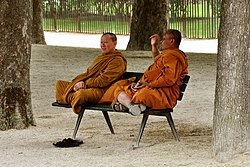 Male and female monastics ("nun", bhikkhuni, Sanskrit bhikṣuṇī) are members of the Buddhist community. Bhikkhu literally means "beggar" or "one who lives by alms". The historical Buddha, Prince Siddhartha, having abandoned a life of pleasure and status, lived as an alms mendicant as part of his śramaṇa lifestyle. Those of his more serious students who renounced their lives as householders and came to study full-time under his supervision also adopted this lifestyle. These full-time student members of the sangha became the community of ordained monastics who wandered from town to city throughout the year, living off alms and stopping in one place only for the Vassa, the rainy months of the monsoon season. 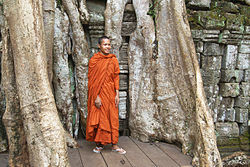 In English literature before the mid-20th century, Buddhist monks were often referred to by the term bonze, particularly when describing monks from East Asia and French Indochina. This term is derived Portuguese and French from Japanese bonsō, meaning 'priest, monk'. It is rare in modern literature. Buddhist monks were once called talapoy or talapoin from French talapoin, itself from Portuguese talapão, ultimately from Mon tala pōi, meaning 'our lord'. Theravada monasticism is organized around the guidelines found within a division of the Pāli Canon called the Vinaya Pitaka. Laypeople undergo ordination as a novitiate (śrāmaṇera or sāmanera) in a rite known as the "going forth" (Pali: pabbajja). Sāmaneras are subject to the Ten Precepts. From there full ordination (Pali: upasampada) may take place. Bhikkhus are subject to a much longer set of rules known as the Pātimokkha (Theravada) or Prātimokṣa (Mahayana and Vajrayana). In the Mahayana monasticism is part of the system of "vows of individual liberation". These vows are taken by monks and nuns from the ordinary sangha, in order to develop personal ethical discipline. In Mahayana and Vajrayana, the term "sangha" is, in principle, often understood to refer particularly to the aryasangha (Wylie: mchog kyi tshogs), the "community of the noble ones who have reached the first bhūmi". These, however, need not be monks and nuns. The vows of individual liberation are taken in four steps. A lay person may take the five upāsaka and upāsikā vows (Wylie: dge snyan (ma) "approaching virtue"). 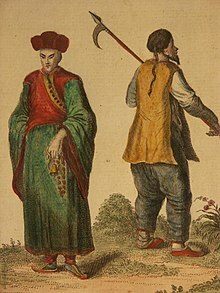 The next step is to enter the pabbajja or monastic way of life (Skt: pravrajyā, Wylie: rab byung), which includes wearing monk's or nun's robes. After that, one can become a samanera or samaneri "novice" (Skt. śrāmaṇera, śrāmaṇeri, Wylie: dge tshul, dge tshul ma). The last and final step is to take all the vows of a bhikkhu or bhukkhuni "fully ordained monastic" (Sanskrit: bhikṣu, bhikṣuṇī, Wylie: dge long (ma)). 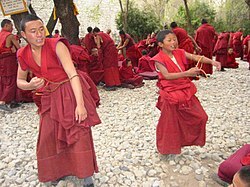 In Tibet, the upāsaka, pravrajyā and bhikṣu ordinations are usually taken at ages six, fourteen and twenty-one or older, respectively. The robes of Tibetan novices and monks differ in various aspects, especially in the application of "holes" in the dress of monks. Some monks tear their robes into pieces and then mend these pieces together again. Upāsakas cannot wear the "chö-göö", a yellow tissue worn during teachings by both novices and full monks. ^ What is a bhikkhu? ^ Buddharakkhita, Acharya. "Dhammapada XIX — Dhammatthavagga: The Just". Access To Insight. Retrieved 18 December 2012. ^ Roberts 1837, p. 237. ^ a b how to become a monk? ^ Clark, Donald N. (2000). Culture and customs of Korea. Greenwood Publishing Group. ISBN 978-0-313-30456-9. ^ a b Sorensen, Henrik Hjort (1992). Ole Bruun; Arne Kalland; Henrik Hjort Sorensen (eds.). Asian perceptions of nature. Nordic Institute of Asian Studies. ISBN 978-87-87062-12-1.